When I'm in the car, when I'm cleaning the house, even when I'm giving my daughter a bath I can be found singing a song. Most of the time, it will be a Christian song. There is just something about a beautiful melody accompanied by words that truly have such truth and such power that I cannot help but love. I was first introduced to Laura Story a few years ago through her song Blessings. I immediately fell in love with the beautiful words and the incredible voice behind them. There was something just so classic about her. The songs simple, but the words powerful. I was excited to be able to experience her newest music! It did not disappoint! Once again I found myself falling in love with these songs. Listening to Laura sing, you can tell that she sings with her whole heart, giving it all to God...and isn't that what worship should be? I didn't feel as though I was purposefully being entertained (though her music certainly is entertaining), but instead felt as though I was being taken along this worship experience with her. How absolutely beautiful is that? But it truly is just one of the many great songs you can enjoy on this album. I've often said there tend to be two categories that Christian music most often falls into. There are those albums that make you want to shout for joy, dance and sing praises to God. Then there are those who make you want to stop, listen to the words and just find peace in God's presence as you worship. For me, this album was certainly the later. Ready to experience it for yourself? Open Hands is available to purchase now. What gorgeous and inspirational lyrics!! Love love love! This CD sounds really nice! Thanks for the giveaway. 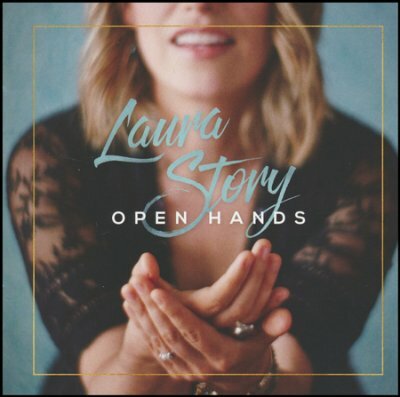 Laura Story's voice is very beautiful and the lyrics of Open Hands are so moving. I've been a Laura Story fan for years... my kids really like her music too! I would love to play this cd in the van for them to hear. I love when they can listen to uplifting music and I don't have to worry about them hearing the wrong type of thing. I think she is an amazing singer such an amazing voice and great blessing to hear her music...Many blessings everyone!!! Laura Story's voice is awesome and her lyrics are so inspirational. I love the praise and worship of Laura Story's music. What a blessed voice! Sounds like she has wonderful music!